The problem is that it can so easily become about me. Without realizing it, many churches fall into the subtle trap of making worship about me. They look for music to entertain and inspire me. They pick hymns that talk about how God makes me feel. They preach sermons that focus almost entirely on me and my life. Now, don’t get me wrong. All of those things can be good in the proper perspective. There is no “I” in team, but there is definitely an “I” in worship. I do go to worship to be inspired and taught. It should affect how I feel. It should apply to my life. But, really, worship isn’t about me. Worship is first and foremost about my God and Savior. The music of our worship shouldn’t focus so much on how I feel as much as on what God has done to save me. Good preaching should first and foremost proclaim the forgiveness and freedom that Jesus won for all people on the cross. Worship is about our God and what he has done. Worship is also about those sitting around me. The writer to the Hebrews encourages us: “Do not give up meeting together, as some are in the habit of doing, but let us encourage one another” (Hebrews 10:25). Worship is about engaging and encouraging each other. 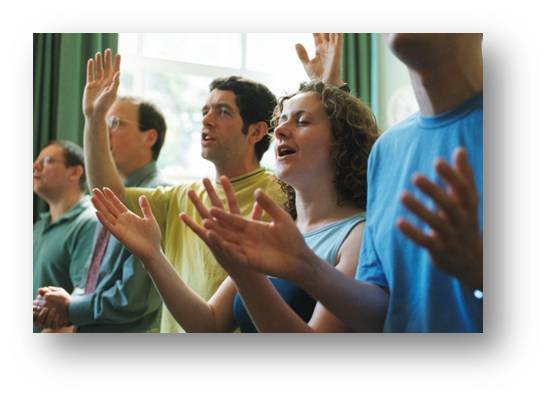 We not only sing our hymns to God. We sing them to encourage one another. We lift our voices in prayer for one another. In the creeds, we proudly proclaim to each other what we believe. But liturgical worship – Lutheran worship – takes work. It takes work to really think about what we are saying and singing. It takes work to listen to and apply the Word being proclaimed. It takes work to worship. Think about that the next time you park yourself in the pew. This isn’t about me. This is about my God who speaks to me in Word and Sacrament. This is about praising and thanking my God for the wondrous works he has done. This is about encouraging and building up those who are sitting around me. And the amazing blessing is that through the gospel message proclaimed in worship, I too will be encouraged. I too will be built up. I too will be inspired. “Praise the Lord. Praise God in his sanctuary . . . praise him for his acts of power, praise him for his surpassing greatness . . . Let everything that has breath, praise the Lord. Praise the Lord” (Psalm 150). Nicely said. Would you mind if I borrowed rather liberally from what you have written here for my own church’s newletter this coming September? I’m beginning a series then on worship, and believe that I can incorporate many of the thoughts you have expressed here into an article leading into the series. Thank you and yes, feel free to use it as you see fit. Inspiring and encouraging reminder that there most certainly are personal blessings in corporate worship experiences, but God is at the center. He is the “guest of honor” whom we come together to corporately honor and celebrate with our brothers and sisters in Christ. Amen! I like the idea of God being the “guest of honor,” but in a sense, we are guests too, coming into his home, sitting at his feet, receiving his Sacrament. Thanks your kind words! First, thanks for reading and chiming in on my blog. The first sentence of The Purpose Driven Life is “It’s not about you.” To take the thought even further: Being a living sacrifice is our actual worship (Romans 12:1). Our lives (our act of REAL worship) are most certainly about us, but about Him. First of all, you are absolutely right. The focus of our lives and not just our Sunday mornings should always be our Savior God. Thank you for that. And you’re right, I think I unintentionally plagiarized Rick Warren. It’s been years since I read that book. I didn’t even remember that was the first sentence. Thanks for a great comment! I wholeheartedly agree! I wrote on this issue a number of months ago here: http://pastormikesmusings.com/2013/08/29/the-real-worship-wars/ I’ve seen people far to easily looking around them and more concerned with the people beside them than the person in the mirror. The real battle is getting over my selfish desire and tendencies to point myself and those around my back to Christ. The other key passage in this issue is Ephesians 5:19 which contains the well known “psalms and hymns and spiritual songs” but I haven’t as often heard people mention the beginning of that verse “addressing one another.” There needs to be an “others focus” to our worship, specifically our worship through music. I agree wholeheartedly. Many Christians realize that worship is supposed to be Christ-centered, but they forget that it is also meant to encourage each other (see Hebrews 10:25). Thanks for your comment! Worship is about God and me. God is not an abstact faraway entity. He is my God (personal). Only when I acknowiledge Him as my God it gives me the reason to praise and worship Him from my heart, soul and mind (all that I have). To acknowledge who He is, is to affirm my faith in Him. It pleases Him that I praise and worship Him in Spirit and in truth. He accepts my worship and inspires me to go out and share His wondrous love. We cannot concentrate on God only in worship just like other religious people do – we must personalize that worship to mean something to us.- our preious relationship – sinner and our Redeemer. It is not about me only but God and me. How wonderful He is to think of His love to insignificant me – awe-inspiring! What an example He is Who gave Himself for us and forgives our sins – may we be His follower to give to others His love and also forgive as He has forgiven. O God Omniscient, Omnipotent, Omnipresent – there is none like You – I can trust and believe in You my Creator . Thank You for Your faithifulness and mercies anew every morning – You are above all things my God and my Lord! Let us have a balance in worship knowing our position in Christ. When we meet with God in worship and He touches us anew each time we worship, the result is “It has been good to be in the house of the Lord.” and we look forward to the next worship session in community with fellow believers – God’s loving family. When we witness for Him in our lives, word and action – we worship Him with our testimony. So worship is not just in church on Sunday morning but through the week, 24 hours a day in His Presence. Thank you for your comment and invitation to visit with you.here. Now I understand. Worship via LSB is a time for LCMS Lutherans to be with God. What you see in LSB only makes sense to LCMS Lutherans and not to outsiders. I thought that the time on Sunday morning was, at least partially, an opportunity to evangelize. Some congregations see Sunday morning as a time of worship AND evangelism. I guess evangelism should be done other than Sunday morning. Thank you for your comment. I am not a pastor of the Lutheran Church Missouri Synod (LCMS) and we do not use the Lutheran Service Book (LSB) to which you are referring, so I cannot comment on that. It seems you have an issue with that hymnal or maybe with liturgical worship in general. First of all, as I state in the article, our worship is first and foremost about our God, but it also is for the people around us. I agree with you that our worship doesn’t have to be an either/or, but a both/and. When the gospel is proclaimed in the worship service, it serves to glorify God, strengthen believers and point the unconverted to Christ. I think your concern is that liturgical worship is gibberish to the visitor/prospect and therefore does not communicate clearly the gospel. Is that correct? I understand your concern, but I don’t know if I agree. The gospel is clearly expressed in the traditional songs of the liturgy, the creed and lectionary readings. You can’t go to a liturgical Lutheran worship service without hearing over and over again how you are a sinner and what God did to save you. The truth is, a first time visitor in any Christian worship experience will not grasp everything that is going on whether you are liturgical or not. I have found in my experience that the style of worship is not the biggest factor on whether a first time visitor has a positive worship experience. The biggest factor is how well it is done and explained, as well as the participation of the congregation. Think of it like a restaurant. If you go to a restaurant and you see the waiter walk by with a sizzling tray. He takes it to a table. The people at the table ooh and aah. You can see the enjoyment on their faces as they eat it. What do you end up saying to the waiter? “I want what they are having.” Whether you are liturgical or non-liturgical the impression people take away from our worship has little to do with style and much to do with the way God’s people participate in the service. Please let me know if you have any other thoughts or if I misunderstood your concerns. When we put ourselves as the center of worship instead of him we have totally lost the point. We are there to usher him in. He doesn’t need a show. He wants us to be pure with our worship. As we focus on God, His word, His gospel, and His glory we find ourselves worshipping because we are testifying to the worth of God. The word “worship” stems from this (worth-ship), which means we give honor to what is honorable. Your point about working to worship is extremely helpful. If we do not work to shift our focus, then we will drift into selfish sensationalism. This is a great article. Thanks for writing it! I didn’t know the etymology of the word “worship.” Thank you for that and for your encouraging words. Hi! I come from the opposite end of the worship spectrum from liturgy and I’m not even sure I know what it is. I tried to look it up on youtube, but I couldn’t find anything that was both quick and simple. As an outsider, everything I could find seems intimidating and confusing. But I’d have to imagine that somebody coming from a liturgical setting would be like a fish out of water when it comes to the more contemporary settings. I know that there’s no one right way to praise God, I just hope that the more traditional and liturgical churches find a way to explain themselves to people like me – so that we can feel like we are a part of what is going on around us. Thanks for your comment. I think you hit the nail on the head. Liturgical worship can be and is only beneficial if it is explained and understood. Schroera, I couldn’t agree more! Part of our understanding of true worship is surrender to God. And what does God do? He sends us to people! But He sends us with truth, not a subjective, humanistic, “Self-on-the-throne” mentality! Thanks for the article. Stay in touch! Worship isn’t about me, but it certainly is FOR me! As well as for strengthening those around me…. You are right. Worship is also for me. There is no “I” in team, but there is an “I” in worship. Thanks for your comment! Drilling down further, the purpose of worship is not just about remembering what our God has done, it is about receiving what he has done by what we are doing in worship. Christ earned forgiveness, life, and salvation by what he did; he delivers that forgiveness, life, and salvation only through Word and Sacrament in our worship. HOW we get forgiveness in large part determines the focus of our worship forms and styles.